ADS Channel 7 Adelaide. 1976. LP (OP) M7. MLX-125. 1976. 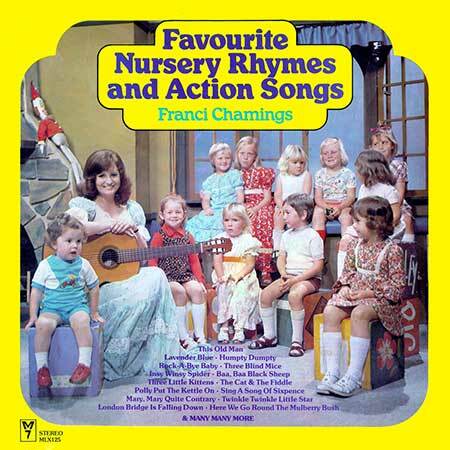 "FAVOURITE NURSERY RHYMES AND ACTION SONGS". Vocals: Franci Chamings. Recorded at Slater Sound, Adelaide. The Grand Old Duke Of York. Oh! Dear What Can The Matter Be. London Bridge Is Falling Down. Stand Up - Sit Down. Once There Was A Snowman. Rain Is Falling All Around. My Thumbs Are Starting To Wiggle. Baa Baa Black Sheep/Moo Moo Juicy Cow.